Excel Marco’s Smart “bubbling” Tank Gauging System is designed specifically for the offshore and marine industry. Suitable for measurement of ballast and other water tanks through the use of electro-pneumatic technique, it also provides seamless integration for level or pressure transmitters installed for mud and fuel oil tanks associated with jack –up rigs and FPSO. The system overview is shown below. 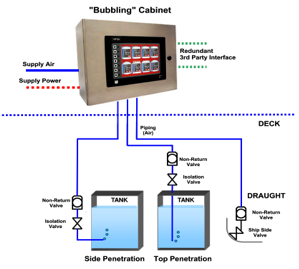 The “bubbling” cabinet measures the level of up to 24 tanks each and provides correct tank data, such as product level, tank volume or weight. No electrical or electronic device is placed in the tanks, thus eliminating the need for explosion proof devices. Tank process information is displayed on the touch screen. Programmable logic controller is used as the system’s intelligent device for maintenance functions as well as diagnostic information. This information is displayed on the screen for ease of use. Options for interfaces to offloading computers or vessel monitoring systems include the industry standard communication protocols such as Modbus RTU, Fieldbus and Ethernet networks. Redundant communications are available, where required depending on the class regulations and vessel type. Real-time tank gauging data via redundant 3rd party interface. Integrated components designed for harsh environment.